52 Weeks #8: Week 8- Of Plywood, Practice and Cleaning up. I have to say I have had a real good week in the shop and I am quite happy with the outcome. As noted earlier on in this series I have been wanting to get things a bit more organized and also get my lathe cleaned off and able to be used. So I spent a good portion of time this week working on a new cabinet (still needs doors but I will make them this time I promise) and some drawers for my powertool bench, all of which gave me some good practice. 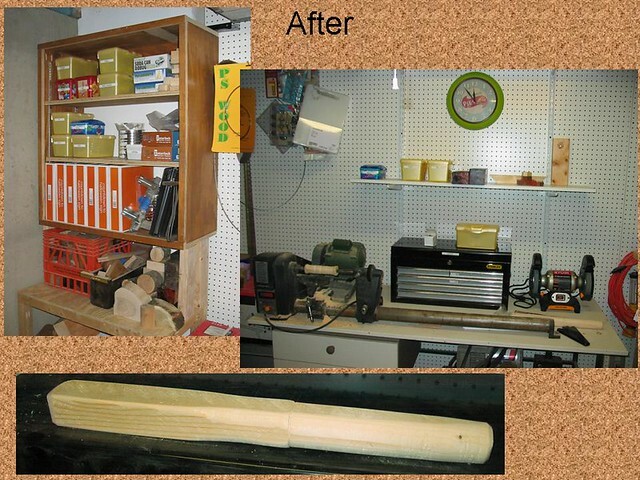 The best part is that I did not need to buy any new materials, some of you may have seen this blog about the cabinets we got from my wife’s friend. Well pieces of it have been sitting around here for over a year now. So not only did I clean up the basement shop some I also got a chance to get some stuff out of the garage. Here is what I was trying to deal with as far as my Lathe bench was concerned. 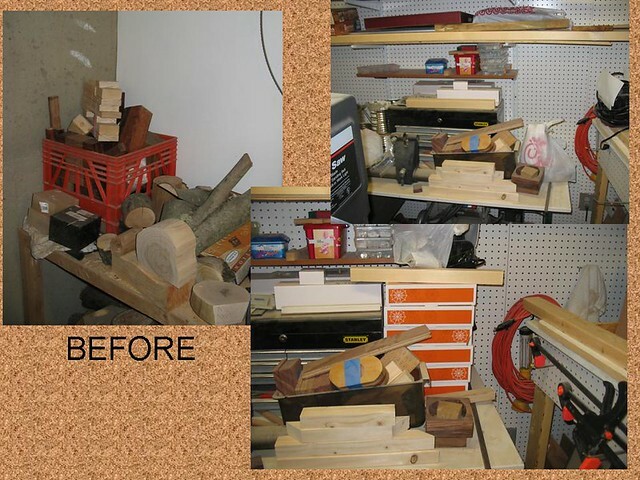 The little wood rack was a solution I built a little while ago to handle stuff I brought home from work or found. I added the cabinet to the top to handle some parts storage mainly. I am now happy to say that I can actually work at my lathe and am looking forward to putting some of that wood on the rack to good use, I am looking at ideas for a small lumber mill, so hopefully that will be coming soon. Oh the picture at the bottom is the first thing that I have ever actually turned on my own lathe. Nothing special, but I wanted to just fire it up and try it out. So I now have a small club made out of a 2×4. More much better looking work to come. 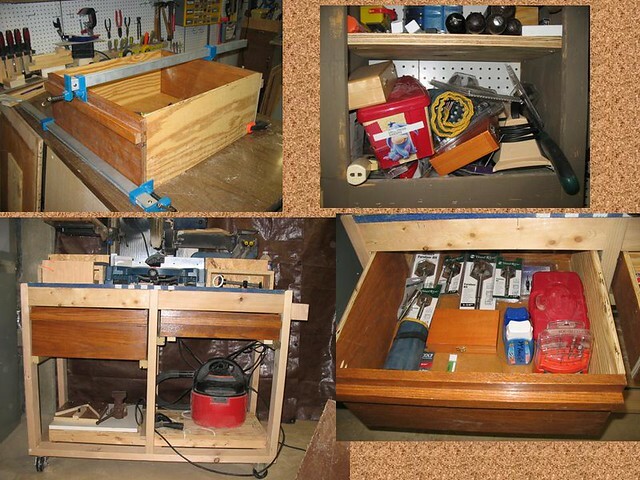 I also added some much needed drawer space to my powertool bench. The larger one as you can see helped a bit with my drill bit storage issue. I am still devising a way to actually store all the bits in holders. Which will really help this drawer out, I made it so it could open from both sides if I wanted to. So there you have it a productive week in the shop. I am really looking forward to other things coming now that I have my lathe. I have of course been looking all over the web and some books as to get better acquainted. Thanks for looking and hope you all have some good shop time coming up as well. Good job man. It looks much better and I bet it is becoming a place of peace for you.